(73%) 24 of 33 customer would recommend this product to a friend. The PureLine Pure Pro XL is a powerful above-ground pump featuring a corrosion proof construction that delivers years of reliable service. This Pure Pro XL is high performance pump that is quiet, efficient and all of this at an affordable price. The top discharge design fits most filters making installation a snap and its extra large clear lid allows for easy cleaning. Replace your old inefficient pump with this water moving dynamo. A Answered on 4/14/2019 by InyoPools Product Specialist Patrick P.
Yes the PureLine PL1501 would be a great replacement for the Hayward Power-flo Matrix model #SP1592TLFP. However you would need to remove the twist lock cord on your old pump and install it on the new pump as the new pump uses a 3 prong plug, but this will be an easy swap out. Hi Roy, this would be a great replacement pump for your waterco supermite model number 2401100U, you may have a little re-plumbing but it should be minimal. I have a Hayward pro series sand filter. The GPM rate is 35 and holds 150lbs of sand. Is the PL1501 pump compatible with this filter? A Answered on 4/5/2019 by InyoPools Product Specialist Patrick P.
Hi James, As long as this filter is being used on an Above Ground Pool then this filter would be a great match and would work fine for you. Is this a suitable replacement for a Hayward SP1580 1 HP Power Flo Lx Pump? Yes, this would be an excellent replacement pump for the Hayward SP1580 1 HP Power Flo Lx Pump. The gallon per minute rating should be equivalent. Hi, Ronald. Yes, this pump would work if you have a large enough filter. Can this pump be turned to a side discharge?? Hi, Jat. Yes, it can. Check out our How To Rotate the Discharge Port on a PureLine Pure Pro XL Pump guide. I have an 14ft by 55" above ground that came with a 0.07hp.It does not work.Will this pump work? Hi, Steven. This pump can be used if you have large enough filter. Does this pump replace a 72729 pump? Hi, Caleb. Yes, this pump will replace model # 72729. Hi, Kathy. A 1 hp or higher pump will be sufficient based on your current filter size and additional features you have. My hayward is direct wire. Can I use the Pure Pro? Hi, Thomas. Yes, it can by removing the pump power cord to use your existing wiring. Can this pump be used to vacuum debris from in ground pool? If so do you have adapters for it so standard vacuum hose will attach? Being that this is an above ground pool pump no, it wouldn't work for that application. It wouldn't be able to get a prime going very well for it needs to be gravity fed water. Can the discharge be rotated to the 9 o'clock position? A Answered on 6/27/2018 by InyoPools Product Specialist Kevin G.
Hello, yes this pump can have the discharge rotated to a horizontal positioning. To see how this is done, please click here. Hello , I have a proline 1.5 hp motor for a 18 ft round pool with a sand filter was wondering if the 1 hp motor would be ok? Hi, Paul. Yes, this 1 HP Above Ground Pool Pump - PL1501 will be sufficient for an 18' R pool. Can this pump the hardwired? Good day, yes this can be hard wired to a 110 breaker. Currently have the Hayward Power Flow LX 3/4 hp pump that quit working. We have a 27' round above ground pool with 54' sides, but the center is dug out deeper (recently purchased a 72" expandable liner because the existing 60" kept slipping out). We have two bottom drains as well. Our current filters max GPM is 75. Would be ok to upgrade to a 1 hp pump? I have an 18ft round above ground pool with a hayward Pro Grid DE 2420 filter. Wondering if this would work with my system. Hi, Joe. This pump can work with your system as long as it does not exceed your filter's max flow rate of 48 GPM. Would this pump be a good replacement for a Century serial: 323073M Part 7-186533-22? Hi, Jessica. The Part # 7-186533-22 provided is for the motor, I will need the pump housing model in order to confirm if this pump is a suitable replacement. Hi, I have a small above ground pool 16x8x3 what size pump do you recommend? Hi, JR. A 1/2 hp to 3/4 hp pump will be sufficient for jus water circulation. If you're operating other equipment like a pool cleaner, heater etc, you will need a larger pump and a filter to match. If you can provide us with all of that info we can size you a pump and filter system. A Answered on 5/29/2018 by InyoPools Product Specialist Patrick P.
Would this pump be the right hp for an 18’, 42” deep above ground pool? Our filter is 75-80lb sand filter. Hi, Susan. This pump is too large for a 75-80 lb sand filter. A 1/2 HP pump will be sufficient. Would this pump be a good replacement for a Hayward model # Sp1510-z-1-xes? I have a 18 * 48 round pool with a AquaPro 75 lb sand filter. Do I need a .75 or 1 hp pump to replace the old one? Hi, Kenny. A 3/4 hp pump might even be too larger for a 75 lb sand filter. I would not recommend a pump over 3/4 HP. Hello, this pump would work perfectly fine on your 22' round above ground pool. Yes this PureLine Pure Pro XL Pump would be a great replacement for the pump on your current Game Sand Filter system. Hi, MJust. Yes, the discharge can be rotated. You will need to permanently remove the Pool Pump Mounting Flange. Keith, If you are referring to the internal thread, any standard 1.5" hose adapter should fit. If you are referring to the outside threads, those are a specific thread pattern. Nancy, It will replace it you are using a standard threaded hose adapter. if you are using a hose with a union fitting, the hose will not fit this pump. Mary, The pump does have both male and female threads. Hi, Skip. Yes this PL1501 pump can be used to replace the Speck PE71-ll-V Pump. You will have to use different connections. Can this be used as a salt water pump? Hi, Jeremy. This pump can be used to operate a saltwater system or be used with a saltwater pool. Can I use NE170B to replace a SP-1575-1 for my inTex pool? Hello, you can use a PL1501 pump in replacement of the SP-1575-1 series. Can I use this pump to replace a Hayward power-flo lx? A Answered on 6/26/2017 by InyoPools Product Specialist Stacey M.
Hello, Yes this would be a good replacement. my current above ground pool pump is a Hayward 1 hp model sp15921cnp side discharge will your pump 1521 interchange ? Hello, the PL1501 is not a side discharge unit, so this would not be interchangable. Can this pump be used in place of a Hayward power flo matrix sp5500z2? Hi, The pump you have is a 1.5 hp but if you're looking to downsize the system then this pump can be used in place of the Matrix Pump that you have. is 75 gpm good enough for a large oval above ground pool or what determines gpm? A Answered on 6/13/2017 by InyoPools Product Specialist Lennox H.
Hi. If maintain and service properly you can get 5 years or more on average. Hi, Larry. Most above ground pool pumps have 1-1/2" ports which will have a 2" ID. If you have a larger enough filter you can go with a larger pump. I have an Intex 8 ft., 6 sided pool that holds about 640 gals. The pump/filter that came with the pool is inefficient and want to replace it without costing an arm and leg so to speak. What would be a good pump/filter to replace this with? A Answered on 6/22/2017 by InyoPools Product Specialist Lennox H.
Hi, Laura. You can use the Hayward VL Series Sand Filter Systems - VL40T32 for a pool that size. I have a Pentair dynamo 1hp motor, would the pureline 1hp motor be able to be used in my application. I sure I would have to change hoses / fittings ? A Answered on 6/6/2017 by InyoPools Product Specialist Hector F.
For an above ground application, this would be a suitable replacement. You would need to use standard plumbing/hoses and fittings versus if you have a set up per Pentair only. I.E. unions at the pump. Also, you should be able to get those standard fittings, hoses and or plumbing at a local hardware store. You can go with this PureLine PL1501 or if you want the exact pump you have then the Hayward SP1580 Power Flo LX is still available. I am replacing a century motor will this work? Hello, but you want check specs and frame hook up to see if this would match your current unit. Hi Sarah yes you could use this pump to replace the Sta Rite jwpa5el-2a however the plumbing ports on the pump are not in the exact same location so you may have a bit of re-plumbing. I am replacing a Pentair 1 horsepower pump. Would this one work for my pool. A Answered on 5/24/2017 by InyoPools Product Specialist Hector F.
Please call in with your pump model number or send us some images of the pump through our support request page so we can look into a compatible replacement. I have a 20'x48" above ground pool with a Summer Waves Sand filter pump. The pump is bad and I need to replace it. The pump did not give us adequate water flow. what pump would you recommend? Hi Jack, I would suggest this PL1501 PureLine Pure Pro XL pump for your sized pool. Please note that the plumbing ports might not be in the exact same spot as your old pump so you may have some minor re-plumbing. What causes loss of primer and high pressure in the filter? Hi, Vicki. A suction leak cause air to get into the lines can cause the issue that you're experiencing. You will need to check the pump o-rings and hose connections. What is the expected power load from this pump in AMP/hours? Hi Stephen, This pump draws 9 amps. Earlier I asked for a recommendation on a replacement for a dynamo pool pump motor part # 340197. I go an answer of 1 h. p. 115V thru bolt motor BN25 which is just the motor. I am wanting to replace the motor and the other section that connects to it with the strainer basket. Please recommend which one I need. Hi Lisa, The PL1501 is a great pump and would be a suitable replacement for the 340197 Dynamo Pump, the only caveat is that the plumbing ports on the PL1501 are not in the exact same position as the Dynamo pump. This means that you may have some re-plumbing. If you are using flexible hoses between your pool and pump as well as your pump and filter then this may not be an issue. If the plumbing being in the exact location as your old pump is important then I would suggest this 340197 Dynamo Pump as it is still be produced and the plumbing ports are located in the same spots as your current pump. I have a 24ft. round 4ft. depth above ground pooI with a Waterway PH220-6, 2hp, 2 speed motor with a side discharge to my Waterway 808-0167.1008 filter. The high speed on the motor went out but the low speed is OK. I changed both the start and run capacitors to no avail. I'm guessing I need a new pump. Someone told me that I don't need such a large pump/motor. The pool should work fine with a single speed 1hp or at most a 1½hp pump/motor. What do you recommend for a new pump/motor. Hi, the discharge port can be rotated so that you have a horizontal discharge. To do this you will need to permanently remove the Pool Pump Mounting Flange Key #15. Hi, Randy. This pump can work with a 16'x48" Coleman using the proper connections. Hello Sean, I would suggest SLR9 1 HP Pump Above Ground Horizontal Discharge - 94022430, but if you went with the PL1501 you would have to replumb to make work with your system. I have a tuff pool 13x21 above,,Clearwater high rate sand filter with a max. flow rate(gpm) 45 . would this pump work? Yes, this would be a suitable replacement pump Clearwater sand filter. would this pump work for an above ground intex pool? And what kind of filter system would I need with it? A Answered on 4/7/2017 by InyoPools Product Specialist Megan C.
I have a 18 by 52 above ground pool with a Hayward 1 & a half horsepower motor, will a 1 horsepower motor run it efficiently? Yes a 1 horse power pump would be sufficient for a pool of that size. I have a 1HP CYGNET WIT 2 INCH OUTLETS USED FOR A WATERFALL. CAN I USE THIS PUMP AS A REPLACEMENT? A Answered on 2/6/2017 by InyoPools Product Specialist Scott W.
That pump has 1.5" ports which would not be a problem, just have to use an adapter, but what is the distance in feet from the pump to the waterfall so I can tell you if this pump will be a suitable replacement for what you currently have. A Answered on 1/19/2017 by InyoPools Product Specialist Alan M.
Hello Boris, I do apologize that you are experiencing this issue. You will need to contact our customer service staff at 1-877-372-6038 to discuss the replacement of the faulty pump. When you call, please have ready your order number ready. You may be required to send us photos of your pump, but all of that will be discussed once we have spoken with you. Thank you. You can replace with the PL1501, though it will not have the same flow rate as the E71-1. The E71-1 has a little higher flow rate compared to the PL1501. If that is alright for the system that you currently have than the PL1501 would be a good replacement. What filters work with this pump? A Answered on 9/20/2016 by InyoPools Product Specialist Alan M.
We have a number of different filters you can use with this pump. There are different options from Sand Filters, Cartridge Filters, and DE Filters from a number of different sizes and manufacturers. You can view the different filters at our Swimming Pool Filters page. I have a 15' above ground pool, currently with a Hayward Filter - Will this be the right filter for my pool - or do I need more power? That pump will work with what size pool you have. is this pump Square flange? how many days is delivery time once ordered? The motor on this pump is a C-face round flange motor. Delivery time can vary between 5-7 business days for free ground shipping. This pump is available for Next Day Air, 2 Day Air and 3 Day Air shipments. I was using the HAYWARD 1.5 HP RPM3450 (POWERFLO MATRIX) with the Pro series sand, but it stopped working and I need a new motor. Can I use this one ? Hi George, This pump can be used as a replacement. The pump is turning off after a short time. Probably bad right. The pump is a flowclear 90342. Cannot find any info. What do I need to do? Hi J.T, The pump is probably bad, you will need to contact the manufacturer or the place where the pump was purchased. I have a Coleman above ground pool 18X48. the pump that came with it is weak and I would like to replace it with this pump. Can I do that? Although we have no specific information on what pump you currently have on your pool, yes, you can replace your existing pool pump with another. Just take into account that this pump has 1.5" connections/ports and is a 115v electrical connection. Is the cord 3 prong twist lock. Hi Ted, The cord on this pump is a standard cord, it's not available with a twist lock cord. Tracy, Unfortunately, this will not work with a Pro-Series pool. can this pump be changed to a horizontal discharge? Due to the molding on the housing of this pump, it cannot be modified to function as a side discharge pump. My brother and I bought a pump and filter system from you on 4/28/16 - order #647092 - when our electrician put a new plug on the pump to accomodate our timer box he had turned the system on and when the timer started the pump ran dry - the pump sounds like it's struggling and not as quiet as advertised but it works well and the psi is 15 which I think is high - if I order a new pump will this pump fit the existing filter? Hi Susan, This pump might be too strong for a 14" sand filter, the PureLine 3/4 hp (NE6150B) will be adequate. Do you have a hose kit to install a sand filter with pump model 72729? And what's the part #? Eb, Unfortunately, we do not have a hose kit for that model. Does this pump have an off and on switch? Hi Lisa, No this does not include an on/off switch we would suggest using an Intermatic Above Ground Pool Timer which allows you to set the on and off times for the pump. The timer can also act as an on/off switch. Will this replace the dynamo 340197 pool pump? Hi Tammie, This pump can replace the Dynamo Pump depending on the type of connecting from the pump to the filter. You may need the Buttress Adapter (417-4060). I would like to get a variable speed pump (not a two speed) for my 18 foot round above ground pool, but I am having difficulty finding one. Are variable speeds not intended for above ground pools? Rick, Unfortunately, we do not have a variable speed pump for above ground pools. I have a Summer Escapes pool and the pump just died on me. I need a "Summer Escapes F1000C 1000 GPH Filter Pump and Motor Assembly", but they run close to $200. Would this pump work? The only problem I see is that my current pump is designed to attach to the bottom of the skimmer and I don't know how I could do that with any other pump. Hello, Unfortunately, this pump will not work with a Summer Escapes pool. Yes this will properly circulate a 19,500 gallon pool. Hi Juliet, This pump can replace the Proline SD-10-1N11CB, however, the connects may be different depending on if you're using a pump to filter hose. You may need this Adpater-417-4161. Need to replace a pro line PE 71 1.5 HP pump. Will this one be OK or do you have a similar 1.5 hp model? Hi Tom, yes this should be fine as a replacement for a PE 71 1.5 HP pump. If you have flexible hose between the pump and filter then the plumbing should be straight forward. If you have rigid pvc between the pump and filter then you may have a bit of re-plumbing. Hello. We have a 16 ft around and 4 ft deep Coleman pool. The pump is crapping out. It is a flowclear 90342. Would this pump be a good replacement? Is there anything else we would need to purchase to make it work? Hi Dana, Yes this would be a good a replacement for your pump on your 16' round pool. It would be hard to say what fittings you may need to hook this up, could you send us a few photo's of your current pump and filter as this would help. I have a proline sd10-1n11xb. Would the pureline 1 hp ne6170b be a good replacement? If not what would be the cheapest way to go? The pump is good but the motor is seized Thanks! Hi Brian, The PureLine would be a good replacement but you may have a little re-plumbing to connect the hose from the pump to the filter. Hi Michael, For this pump we do not recommend these be altered to side discharge. We took one and tried it leaves a large gap on the side of the pump. If you need side discharge then I would suggest the Jacuzzi SLR Side Discharge Pump. Hi Jonelle, This pump can replace the Sta-Rite JWPA5EL-242 but it will you not be able to connect the pump to the filter. The 340197SR pump will be an exact replacement. Hi Lucas, The only part that you could be referring to is the pump Shaft Seal. I have a 24ft. above ground pool. I was running a 2hp Proline pump (came with the pool when we bought the house a few years back). Pump is toast. Will this pump work as a replacement?? I suspect the 2hp may heva been a bit too strong for the pool size (?). Would a 1.5 hp pump work?? 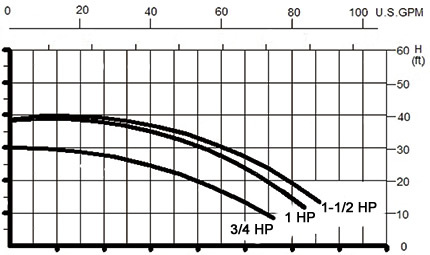 In our experience we have found that 1 HP pump is more then enough power to properly circulate a 24' above ground pool. The good thing about going down from 2 HP to 1 HP is that the cost of operation is much less on the 1 HP. Hi Brian, Most of the times that nut slides over the filter hose like this Filter Hose and Nut the female portion of the nut would thread right onto the the male thread of the PL1501 pump. You should not need to purchase a new nut as the ProLine uses a standard 1.5" female thread and the PureLine uses a standard 1.5" male thread. Will this pump replace SPLA Pool model 72729? Yes the PL1501 would replace the SPLA Pool model 72729.
i have a intex SF80110 sand filter pump. is this pump a good replacement and is the port size the same? Hi Joseph, This filter could work with your Intex system with some slight re-plumbing. You would also want to make sure the flow rating listed on your filter which is normally stated as gallons per minute (GPM) is at least 60 GPM to be able to handle the output of the Pure Pro XL pump. I have a Hayward SP1510-Z-XBC 1 HP. Is this a good replacement....older pump....new 24'x52" round pool above ground? A Answered on 5/18/2016 by InyoPools Product Specialist Patrick P.
Hi Helene, Yes this 1 HP PureLine Pure Pro XL would be an excellent replacement for your 1 HP Hayward SP1510-Z-XBC. This pump would be more than adequate for a 24' Round 52" Wall Pool. Hello Brenda - The PL1501 is a brand new pump. Can this pump be converted to a horizontal discharge? Hello Lucy, I have discovered that this style pump cannot be modified to a horizontal discharge position. Hello Vince, this pump, The PL1501, is a replacement pump for the Hayward SP1580. The port size is 1.5" and would not need anything additional. Please note that this pump does NOT come with union pipe fittings and those can be found here: PL1643. is this a self priming pump?? I'm a returning customer. Chris- This is not a self-priming pump, the in-ground version of this pump is PL1600 1 H.P. In Ground Pool Pump. A Answered on 3/31/2016 by InyoPools Product Specialist Andy O.
Doyle- The pump lid you will need for the PL1501 1.5 Hp Above Ground Pool Pump is the PO12728CR Pool Pump Cover. As for the hoses, no hoses come with this pump. REPLACING A HAYWORD PUMP WILL IT FIT? Hi, This pump can replace a Hayward above ground pool pump. Does this pump come in 220 volt? A Answered on 10/5/2015 by InyoPools Product Specialist Joe S.
Hello this unit only comes in 115. Is this pump self priming? My 22x14x4 oval is sunken in the ground & I was told I need a self priming pump Help! Tim- The NE6170B 1.5 Hp Above Ground Pool Pump is not a self priming pump. It is an above ground pool pump and will not work on in-ground pools. does this pump have some kind of reset, because i have no power and my circuits are not tripped? Hi Paul, The motor on the 1.5 Hp Above Ground Pool Pump does not have a reset button. You would need to check the timer that the pump is connected to. Hello, is this a good replacement for a Pentair pump 356595, RPM 3450 ? Thanks in Advance. Hi Regina, yes this pump would be a suitable replacement for your Pentair pump 356595. I have a Waterway 22" sand filter and hose assembly. The hose end to the pump does not fit this pump motor. I am having a time trying to find what I need. Please help. A Answered on 7/6/2015 by InyoPools Product Specialist Lennox H.
Hi Pamela, You will a Union, Male End 1 1/2" Mpt (417-4060) that will attach to the pump , then the hose will attach to the adapter. I have an Omega Splash pool 16 ft. round with a 150 lb. sand filter will this pump work on it? Hi Rodney, The 1.5 Hp Above Ground Pool Pump would be too large for that size filter, I would recommend the 1 hp Above Ground Pool Pump (NE6150B). Yes this pump will work but if you have union connections from Sta Rite going from the pump to a Sta Rite filter then that will not work on that pump. You would need to use generic fittings and hoses. I have a Hayward 1 1/2 HP Power-Flo Matrix Pool Pump that needs replacement for an 18' round above ground pool. Would this be a suitable replacement? Shaun - Yes this would be a suitable replacement for 1 1/2 HP Power-Flo Matrix Pump. Be advised, however, it only is designed for top discharge. This pump cannot be adjusted for horizontal discharge. Can this pump 1.5hp be used on a Coleman 16 ft round pool. I have a new sand filter that holds 100 lbs of sand? Just purchased pool and don't like the little cartridge filter it came with. The 1.5 Hp Above Ground Pool Pump (NE6170B) can work on your Coleman 16' Round pool. I have a above ground pond approx. 4020gals. I am looking to replace my pump with a new one and noticed that the one I have is very similar to a regular pool pump any difference ? Above ground pool pumps are designed to only work from gravity fed water versus the inground style which do not need that. In essence you can use an inground model pool pump for an above ground pool but not the other way around. does the discharge on this pump have threads on the inside as well as the outside? Hello Gervin, yes the discharge does have threads on the inside and outside of the port. Our Proline 1.5 hp above ground pool pump has died (Model PE71-II-H side discharge). Is this model a suitable replacement? Hi, I was given a 20'x12'x4' above ground pool. The motor for the pump doesnt work and Im not sure if I have to get the exact same one, STA-RITE brand or if I could get a different one. Ive tried looking up the model and serial #s, but I cant find anything on those. What type of pump will I need to look for? I want to make sure it has enough power. We do have a filter. Hi Ashley for your sized pool I would suggest the 1 HP Jacuzzi SLR Above Ground Pool Pump, this pump would do a great job on your pool. Hi, can this pump handle a 30' above ground pool? Hi Fil, Yes this pump would be adequate for a 30' round above ground pool. Will this pump work with a pac fab sand filter? Hi Brittnee, As long as this is being used on an above ground pool then this pool pump will work with a Pac Fab Sand Filter. A Answered on 5/23/2015 by InyoPools Product Specialist Patrick P.
Hi Bruce, This pump would work with a Sta-Rite filter as long as it is being used on an above ground pool. the port on this pool pump that sends the water to the filter looks to be straight up. my broken pump port sends the water to the left side. can you buy a pump like my broken one. Yes we do carry a 1-1/2 HP Above Ground Pool Pump with Horizontal Discharge. Debbie- The NE6170B, will not match up with the dynamo. The plumbing and size of the pumps will be different , along with all the parts and fittings. The gpm rating is based of the feet of head your pump has. The NE6170B (BC2730) will do about 90 gpm at 20 feet of head. what type of switch does it have or do you just plug it in and unplug to turn on and off? This pump does not have a switch but you could use our Above Ground Pool Pump Timer to automate when the pump turns on and off. You can also use the timer as a manual on/off switch. Does the side discharge rotate to match the filter cartridge? I currently have a side discharge pump. Can the pump be rotated 90 degrees, making it a side discharge? Unfortunately, this pump does not have the ability to turn sideways to make the discharge a side discharge. Can this be wired to 240? Unfortunately, this pump only works for 115v. Is all I need to do is add hoses to each end and put them in the water to make it go? Does this pump meet California code for pool pumps? A Answered on 5/11/2013 by InyoPools Product Specialist Patrick P.
My old above pool pump was down and out! 1. Plugged the skimmer intake hole and return on my above ground pool with small towels. 2. Disconnected incoming and return hose from old pump ( put skimmer hose end in skimmer , prop return hose up against pool wall ). 3. Unscrewed old pump from base. 4. Place new pump on the base and reverse process. Prime new pump and you are back in business. Quick and easy! I shut off old pump, set filter valve to "Closed/Winter", put a Gizzmo style plug in the skimmer basket. Using a screwdriver, I loosened the pipe clamps for the intake and filter hoses. I removed the lid from the top of the filter basket, then removed the drain plug to let the water out. Then I took off the hoses and moved the old pump out of the way. Using channel-lock pliers I loosened the fittings from the old pump and removed them. I dried them off and wrapped 4-6 turns of teflon tape to the threads, then screwed them in hand-tight to the new pump. Placed new pump in position, then reattached hoses and tightened hose clamps. Turned filter back to "Filter", removed plug from skimmer, and let pump basket fill before attaching lid. Turned on pump and checked for leaks. I initially was shopping for a replacement for my Hayward Flowmax pump when I saw this pump recommended at the bottom of the page. I read the veiws and decided to give it a try. If the pump was below average I would get it replaced. I got the pump and installed it after switching the discharge to the side to link up with my D.E. Filter. The process took more time than installing the pump on the base. However after I connected everything I am happy. The old pump leaked and was slow and this pump is powerful and very quiet. I am very pleased. (5 out of 5 stars) Great little pump! after a few weeks of replacing my Hayward 1.5hp Maxi Flo with this Sandman, I find I am still completely satisfied with it. She's quite yet powerful enough to do the job! Had to replace an old Hayward 1 hp pump. Bought this one at a GREAT price and it arrived quickly in 3 days! We lost 0 pool usage time. Installed quickly and easily. We had to keep checking to make sure it was running because it is so much quieter than the old pump. Moves water well and vacuuming pool is no problem. Plus it saves electricity 9 amp pull instead of 11. Barely gets warm after running all day! I definitely recommend this pump and brand! Awesome service just remember to order new adapters with your new pump. Great pump and very quiet! Very quiet working pimp. Every bit as good as the name brand pumps just as efficient. The only reason I didn't give it 5 stars is that there is no on off switch. I will be getting myself a plug in timer so I don't have to pull out the plug to shut the pump off while I switch my filter positions. The only thing you need to make sure the hose you have fits the pump. Mine didn't so I had to order a union. I recently bought this pump for my pool. I could not be more satisfied. The price was great. The shipping was amazing and the item was received within a couple of days. Installation was quick. Highly recommended.